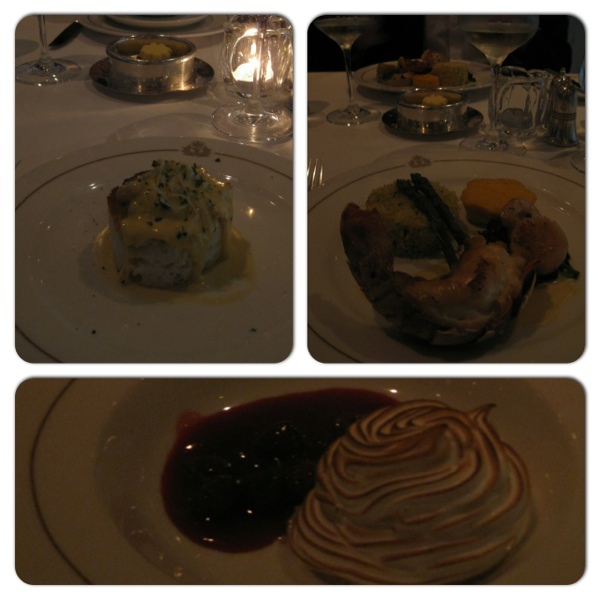 There are so many aspects of our QM2 crossing which could furnish separate posts, but I thought I would limit myself to talking about the food, which was one of the more significant aspects of our trip! 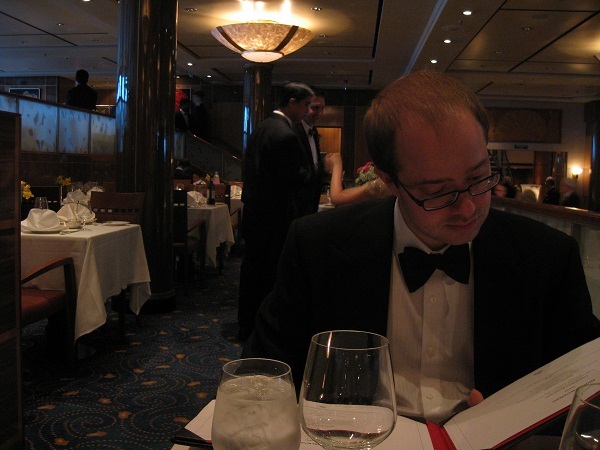 As standard class passengers, we had the option of taking our main meals (breakfast, lunch, afternoon tea and dinner) either served in the Brittania restaurant or helping ourselves from one of the self-service buffet areas. We had a specific table for dinner each night, but otherwise it was first-come-first-served. I was quite pleased that our request for a table for 2 for dinner had been accommodated, and in fact there were many other couples dining in a similar fashion. We only ended up sharing a table a handful of times, in one or two of the bars and twice for afternoon tea, and all the people we met were very pleasant and interesting to talk to. The staff were very helpful and provided me with lots of lovely gluten free dishes – our fantastic evening waiter Norman and Sketty the Maitre D’ were especially good – though actually there was such a range of food on offer that I would have struggled not to find anything suitable. 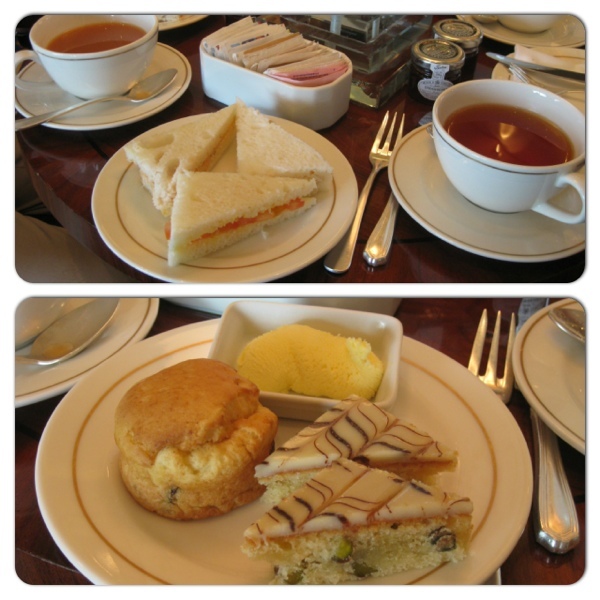 Afternoon tea is a particular favourite of ours anyway, and I was delighted that a little plate of sandwiches, cake and scones were provided for me each day. T faced a daily battle with the waiters who circulated with trays of food, plying guests with more treats than the human stomach was designed for, and we seldom escaped without having drunk at least 5 cups of tea apiece (oh, the hardship!). We had opted for the later dinner sitting (at 20:30), which was great as not only did it give us time to digest our tea, but also allowed for a drink beforehand. Most evenings required smart or formal attire, and it was really lovely to get all dressed up and go to one of the bars for a cocktail. 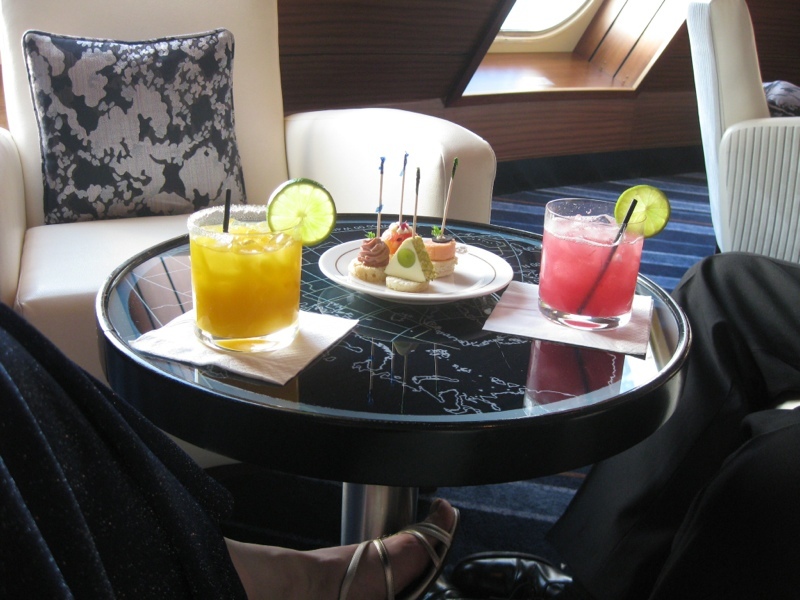 We especially liked the Commodore’s Club bar, up on the 9th deck (out of 12) with a great view out across the ocean over the bows of the ship. 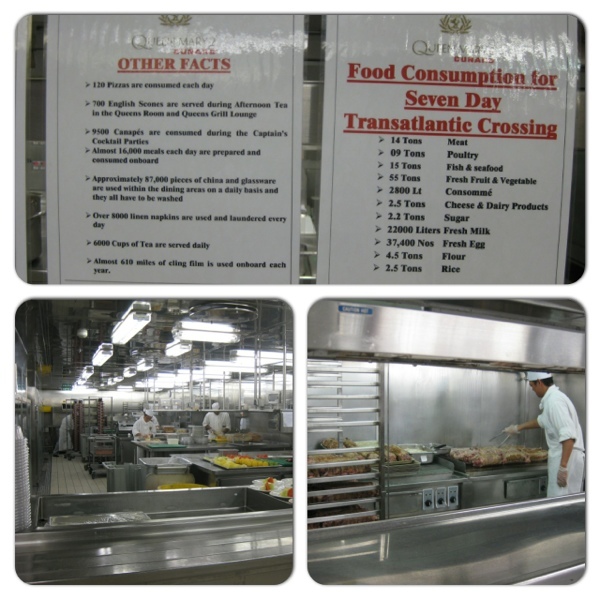 On the last day at sea the biggest galley was opened up so we could take a look at some of the food preparation areas. This was fascinating to see, and we also learned a bit more about the epic amount of food consumed on such a voyage. This entry was posted in Food and drink, Travel and tagged cocktails, food, Queen Mary 2 by Emma Davidson. Bookmark the permalink. Wow, this looks fabulous – and gluten free options too?! Since being gluten free I’ve been wary of cruises, but your experience has made me think it perhaps wouldn’t be so bad after all! 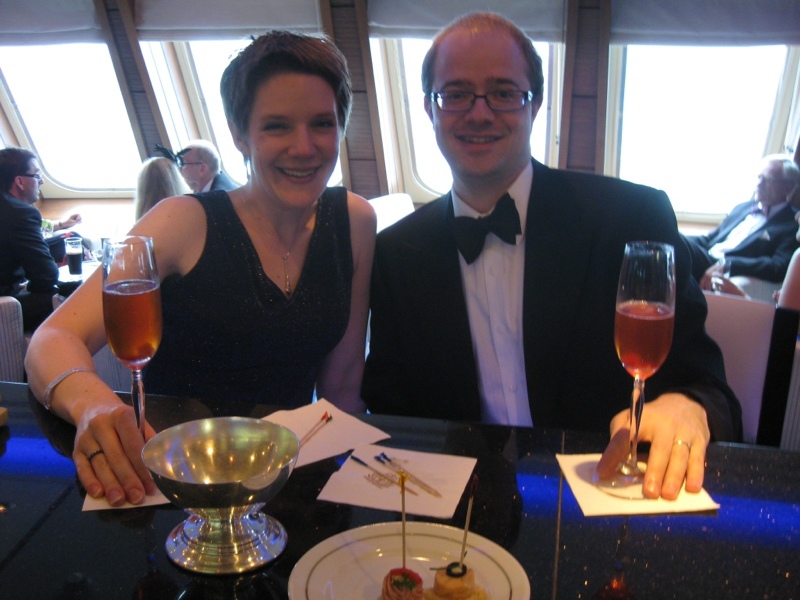 Cunard were really good – I notified them about it when we booked, and there was a reassuring letter waiting for me in our cabin. The maitre’d and our regular waiter were brilliant, and other staff were always happy to help by checking with chefs and advising me what was safe. Each evening I was invited to pre-order for the following day, usually I just chose my dinner but sometimes asked for breakfast items (gf pancakes!) too. I guess they must cater for people with all kinds of dietary requirements so it never felt like an issue. That’s really reassuring to hear. I’ve heard good things about Disney cruises (similar thing where you order in advance for the next day) but it’s great to know other cruise options are geared up to support different dietary needs too. Have you tried Babycakes in Manhattan yet? You’ll have to blog photos if so! I haven’t made it to Babycakes yet, but it’s definitely on my list! We’re going to be staying not too far away from there during September, which I think is going to be ruinous for both my waist and my wallet! !